I love Safari or Zoo themes! Today I'll focus just on Giraffes, though... you could do a cute baby giraffe theme or add them to your idea board for a zoo or safari theme - would be great for boys or girls! Giraffe Cozi - great way to accessorize! Isn't the corset just too adorable!?! Giraffe Cupcake Topper - Gumpaste/Fondant isn't the best tasting thing - so why not go with a flat topper that you can easily lift off and enjoy the cupcake underneath! 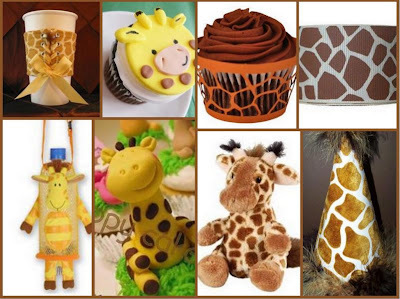 Giraffe Cupcake Wrapper - wrappers are so in right now! This looks amazing with a chocolate cupcake! Giraffe Ribbon - use to carry your theme throughout - edge a white table cloth, add to placemats, signs, favor boxes - anything! Giraffe Drink Holder - how adorable is this!?! Great favor for the little ones! Giraffe Cupcake - This is some skill.. but how cute!!?!? Giraffe Party Hat - So fabulous! I love all the extra details!